I am one of the lucky ones, I love my job at the Dwight Foster Public Library. I spend my days with interesting people who share my love for books. I often find my next book to read when I am checking in the book returns. 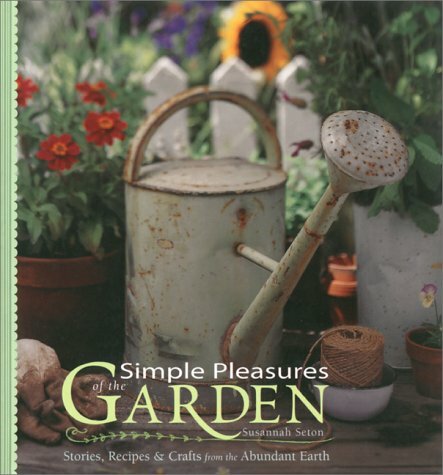 My favorite one right now is titled Simple Pleasures of the Garden by Susannah Seton. The cover captured my attention immediately. It is a photo of a rusty old watering can, a dirty gardening glove and a pot of flowers. The watering can looks like the one stationed by my hose at home. You see I have a passion for the garden. It is my little piece of paradise. Gardening is truly therapeutic for me; I can get lost in the process of weeding. There’s nothing better than getting my hands dirty. Right now life is way too hectic. With a daughter soon to graduate from high school I find my heart and mind are completely distracted. One minute I am overjoyed and the next minute I can’t bear to think of her far away from me. To find some peace in my restless heart I turn to my garden. I am finding the same sense of tranquility and delight in this book as I do in my yard. The book is filled with short reflective essays relating life’s events to the garden. I can totally relate to the author’s perspective and her memories of experiences in nature. The author not only has wonderful stories and thoughts to share, she includes recipes and crafts as well. If you too are one who gets lost in the art of gardening, who finds weeding to be the best therapy, you will find great pleasure in this sweet book. ← Have You Ever Checked Out An E-book From the Library? Gardening is definitely my own activity because it definitely assists myself to enjoy and loosen up. I like to grow plants both in the house and also outside the house. My personal favorite plants are generally tropical ornamental plants and flowers as well as fresh fruit bearing plants.